A customer sent us this this image of two present day soldiers paying respect to their fallen comrades in front of a memorial statue called "Always Faithful" by artist Susan Bahary. 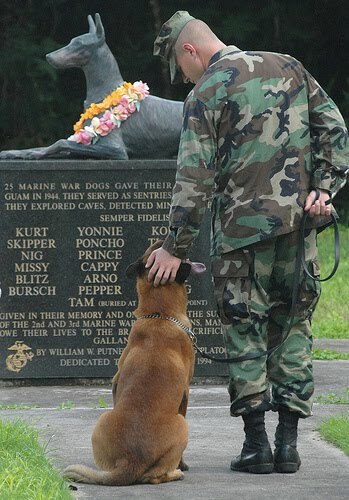 The work is a war monument commemorating 25 Marine war dogs who gave their lives helping to liberate Guam in 1944. These dogs served as sentries, messengers, scouts and mine detectors in World War II. A Marine medic who tried unsuccessfully to save Kurt, the Doberman pinscher on this monument, insisted that he be buried with other fallen soldiers. Twenty-four other canine soldiers joined their human comrades in a common burial ground on Guam in recognition of their service.